So my brother in law got me one of these as a get well present after my latest stint in the clink. I had looked down on these things as a Steering Wheel-esque useless hunk of plastic. I couldn't be more wrong - its bloody awesome! The crossbow training game it came with is surprisingly fun too, especially the FPS combat missions. Anyone know some good Shooter remote games that would play well with this? The hand cannons are better. They actually press the right button when you pull the trigger. You don't have to put your figure up the front. House of the dead, is that the rail shooter zombie bang bang one? I think I'm get me a hand cannon then by the sounds! Also - Hashy is like a double negative. If he hates it, then it must be good! JB hifi have sale on atm too if your after cheapie stuff..
unless you're into Deal Extreme.com cheapy stuff. pretty much the same, but takes a couple of weeks to arrive in the mail, and is a lot cheaper. 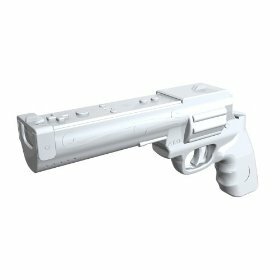 I looked at the handgun looking ones that Kat posted but for some reason went with the zapper, I think it was something to do with not being able to easily use some buttons that some games use a lot. for people with real life friends. louie's clearly on some sort of stupidity drug. Faceman stop handing that s*** out, one of you is enough. if it makes you feel better there a Wii emu for the pc dude. any better than the woeful project 64? I dunno about the legalities of all this stuff.. an admin will prolly nuke stuff that's not supposed to be here anyway. The Wii shop channel sells heaps of n64, SNES and NES titles. I got a few, its a bit meh unless you're heaps into retro stuff. btw Hog have you felt the need for a cooling stand for your Wii (being up there in Cairns and all) ? Do they really get that hot?